The design for our Classical-style Como Plates dates to 1905. 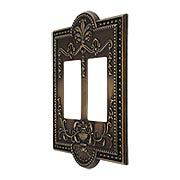 Faithfully re-created in stamped sheet brass, they capture every intricate detail of the originals in an array of authentic period finishes. These elegant switch plates and outlet covers are available in the essential configurations, including toggle, GFI and push button. 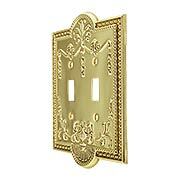 Our elegant Double Toggle Switch Plate was derived from P & F Corbin's Como pattern of 1905. 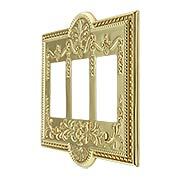 To capture every intricate detail of the originals, this neoclassical design is faithfully rendered in stamped sheet brass. Lightweight, yet durable, it comes in our exclusive Antique by-Hand - a finish that ages gracefully over time into a beautiful natural patina. 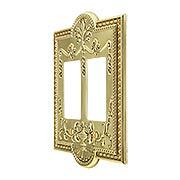 Our elegant Double Toggle Switch Plate was derived from P & F Corbin's Como pattern of 1905. To capture every intricate detail of the originals, this neoclassical design is faithfully rendered in stamped sheet brass. 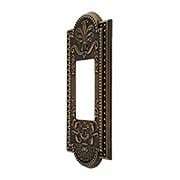 Lightweight, yet durable, it comes in an array of stylish period finishes. 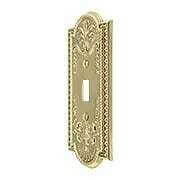 Our elegant Double Push-Button Switch Plate was derived from P & F Corbin's Como pattern of 1905. To capture every intricate detail of the originals, this neoclassical design is faithfully rendered in stamped sheet brass. Lightweight, yet durable, it comes in our exclusive Antique by-Hand - a finish that ages gracefully over time into a beautiful natural patina. 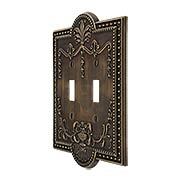 Our elegant Double GFI Push-Button Switch Plate was derived from P & F Corbin's Como pattern of 1905. To capture every intricate detail of the originals, this neoclassical design is faithfully rendered in stamped sheet brass. Lightweight, yet durable, it comes in an array of stylish period finishes. 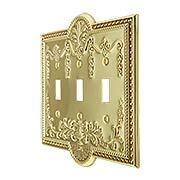 Our elegant Double GFI Cover Plate was derived from P & F Corbin's Como pattern of 1905. To capture every intricate detail of the originals, this neoclassical design is faithfully rendered in stamped sheet brass. Lightweight, yet durable, it comes in our exclusive Antique by-Hand - a finish that ages gracefully over time into a beautiful natural patina. 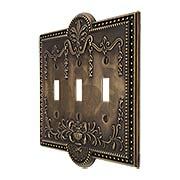 Our elegant Double GFI Cover Plate was derived from P & F Corbin's Como pattern of 1905. To capture every intricate detail of the originals, this neoclassical design is faithfully rendered in stamped sheet brass. 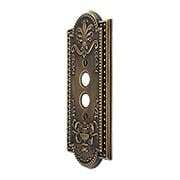 Lightweight, yet durable, it comes in an array of stylish period finishes. Our elegant Triple Toggle Switch Plate was derived from P & F Corbin's Como pattern of 1905. To capture every intricate detail of the originals, this neoclassical design is faithfully rendered in stamped sheet brass. Lightweight, yet durable, it comes in our exclusive Antique by-Hand - a finish that ages gracefully over time into a beautiful natural patina. 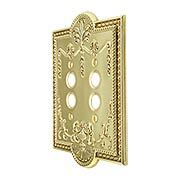 Our elegant Triple Toggle Switch Plate was derived from P & F Corbin's Como pattern of 1905. To capture every intricate detail of the originals, this neoclassical design is faithfully rendered in stamped sheet brass. 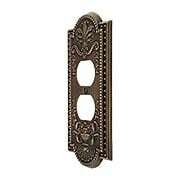 Lightweight, yet durable, it comes in an array of stylish period finishes. 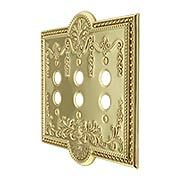 Our elegant Triple Push-Button Switch Plate was derived from P & F Corbin's Como pattern of 1905. To capture every intricate detail of the originals, this neoclassical design is faithfully rendered in stamped sheet brass. Lightweight, yet durable, it comes in our exclusive Antique by-Hand - a finish that ages gracefully over time into a beautiful natural patina. Our elegant Triple Push-Button Switch Plate was derived from P & F Corbin's Como pattern of 1905. To capture every intricate detail of the originals, this neoclassical design is faithfully rendered in stamped sheet brass. 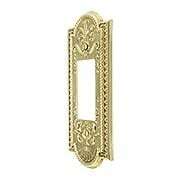 Lightweight, yet durable, it comes in an array of stylish period finishes. 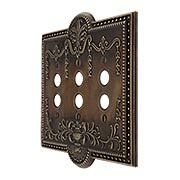 Our elegant Triple GFI Cover Plate was derived from P & F Corbin's Como pattern of 1905. To capture every intricate detail of the originals, this neoclassical design is faithfully rendered in stamped sheet brass. Lightweight, yet durable, it comes in our exclusive Antique by-Hand - a finish that ages gracefully over time into a beautiful natural patina. 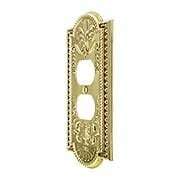 Our elegant Triple GFI Cover Plate was derived from P & F Corbin's Como pattern of 1905. To capture every intricate detail of the originals, this neoclassical design is faithfully rendered in stamped sheet brass. 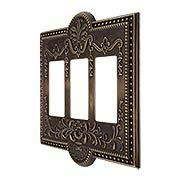 Lightweight, yet durable, it comes in an array of stylish period finishes.